Thanks, I was wondering about this. I’m curious about the fact that I can’t seem to find a way of limiting what _remote_ IPs are supposed to be able to connect – in an environment without firewalls in use. Did I miss something? This is mentioned in the post, please see the “configuration of listeners” section. 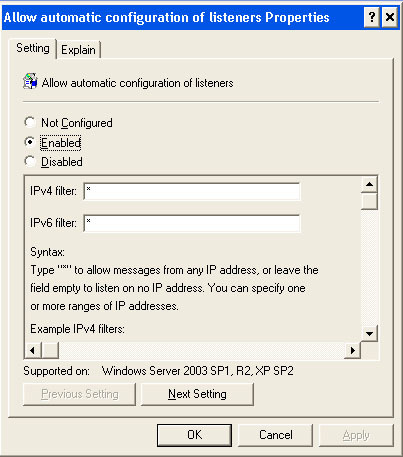 If you are using Windows Advanced Firewall you could also use this to control IP access with the predefined “Windows Remote Management (HTTP-In)” rule. A fair amount of cmdlets use Windows Management Instrumentation (WMI) so you may want to investigate this as well. I interpret the part about “the service enumerates the available IP addresses on the computer and uses only addresses that fall within one of the filter ranges” as what I described above. That you can basically limit the listening to certain IP subnets that the server’s NICs might be on. I’m having trouble explaining it clearly, but it’s what the documentation says, basically. So if you specify “10.0.0.1/24”, the server will listen on the network adapter that has an IP within that range, it doesn’t limit remote connections to connections from within this range. I feel exceedingly dense, but if this is not what they mean, the docs are very unclear. At least to me. I think a firewall might be necessary, if I interpreted the text correctly.